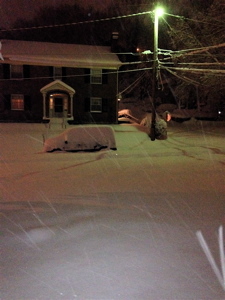 It was coming down hard in Frankfort, KY at 4:30AM. It started falling about 5:00PM yesterday, as if right on cue. Every meteorological model around was tracking a fast-moving storm traveling west to east across the south region. A winter storm advisory began at 1:00 PM Wednesday for Winter Storm Thor. It was raining in Kentucky from before daybreak and kept on pouring the entire day. Temps rose steadily from around 40 degrees in the morning, to near 60 in the late afternoon. Then the bottom fell out. Right when work ended of course it began to dip. I made the critical error of dressing for the day based on the morning, and only had short sleeves. That was “No Bueno” by 5:30PM. I grabbed my 2-year old, Isabella, from daycare and had no choice but to head for the grocery. We had no provisions to get us through what might be several days stuck in the house with three kids. The rain had shifted to sleet and ice. The puddles that had accumulated from the rain were now slushy land mines, waiting for unfortunate shoppers to plop their unsuspecting feet into their chilly depths. The parking lot was all jacked up with the after-work crowd flocking to hit the store before the weather got worse. There were a couple fender benders already as I was making my exit. Then it started snowing, and it didn’t stop until around 1:00PM Thursday. 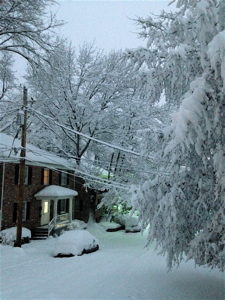 In Frankfort we ended up with 12″ of fresh white stuff. Schools and businesses were all closed naturally. And evidently there were plenty of folks who attempted to drive through the snow. Some were just unfortunate. They got caught on the highways when this hit last night and had nowhere to go. Thor hit fast and didn’t let up, and with all the rain yesterday it put a nice layer of ice underneath a blanket of white. Now I don’t know what people were thinking who woke up Thursday and thought it might be a good idea to try driving anywhere. Kentucky State Police said Interstate 65 and Hwy 71 were virtually shut down. Two accidents and a snow and ice covered hill that semi-trucks couldn’t climb turned the interstate into a giant parking lot, with backups of 10 miles in one spot and 20 miles in another. Tractor-trailers were jack-knifed and overturned vehicles dotted the landscape. On Twitter they were using hashtags like #needrescue. The metro area around Louisville, Frankfort and Lexington had somewhere between 5-13 inches, but when you go south toward Elizabethtown there was upward of 20 inches – which is tough to drive through. Temps have been hovering around a high of 20 degrees most of the day, which is about 30 degrees below normal. Tonight the cold really hits. Frankfort may see -1, which will set a record. That will be a 60-degree temperature swing in slightly over a 24-hour period! 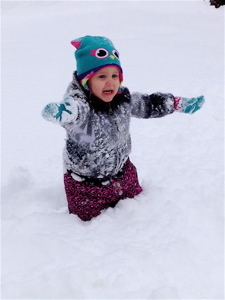 Isabella was an intrepid snow adventurer today, even if she couldn’t move her legs much. This storm comes on the heels of Snowpocalypse 1 two weeks ago, when almost all of Kentucky was shut down for a week, but it was nine days of stuck in the house with kids and animals (but who is counting, right). School and all activities are already canceled for Friday. Not that this is even in the wheelhouse of what Boston has been getting all winter, but it sure is a strong end to an otherwise mild winter. I certainly don’t feel cheated now. The strange thing is, just as the rain was turning to sleet Wednesday, essentially the last vestiges of snow from Snowpocalypse 1 was being erased (which is bringing about disaster two – flooding). It’s like Mother Nature shook her Etch-A-Sketch to clear away her last daydream, and would have a clean canvas on which to draw up something even nastier. I sure hope Mama Nature starts thinking some warm thoughts soon. 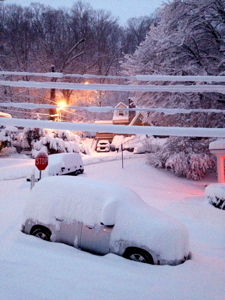 This entry was posted in Events, Family, News and tagged Kentucky, Snowpocolypse 2015. Bookmark the permalink.